British autoclave manufacturer Priorclave celebrated 25 years since first opening its doors for business on the 16th February 1988 and during this period has delivered from its London factory almost 5,000 steam sterilisers worldwide. It makes Priorclave the most successful UK laboratory autoclave producer. 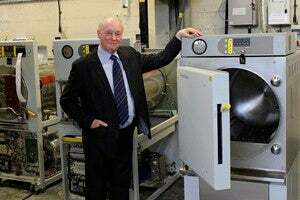 Founder and Chairman Charles Prior is a firm believer that in Britain we have the most talented engineering capabilities and this is reflected in the fact that all autoclaves leaving the Priorclave factory are of British design and manufacture. Endorsing their superior quality and reliability is the fact that Priorclave autoclaves not only sell in the UK, the company exports around 70% to destinations including Asia Pacific, Middle East as well as North and South America. Some notable countries and contract wins where Priorclave steam sterilisers have been installed include Russia, Papua New Guinea, Mauritius and Ecuador. In 25 years this dedicated design and manufacturing centre for autoclaves has created one of the largest ranges of standard steam sterilisers, from compact bench-top front loading to free-standing top-loading and high capacity front-loading autoclaves as well as power door and pass-through double entry machines. It is unlikely that customers cannot find a model to meet their needs. What makes a difference is that Priorclave can incorporate many of its optional items into even the smallest machines at its London factory, unlike other autoclave suppliers where many options only exist on the larger sterilisers. Externally Priorclaves don’t do much – they just sit there like shiny, sophisticated ovens or fridges, with some pretty lights. They are also a bit like a Tornado or Typhoon fighter plane – smooth, clean and attractive lines, but underneath a deceptively vicious killing machine – the victims this time being bacteria and viruses. Buying a Priorclave is seen by the customer a wise investment since it offers the lower overall cost of ownership through highly efficient performance with a first-rate pre- and after-sales support and backed by one of the best warranties currently available. Priorclave also provides excellent and dedicated on-going support to ensure the autoclave delivers the ultimate sterilising process.